Can I draw on my phone or my tablet? Unfortunately, not yet. DADA is optimized for desktop only for the time being. A mobile app is in the works. Can I upload my art to DADA? 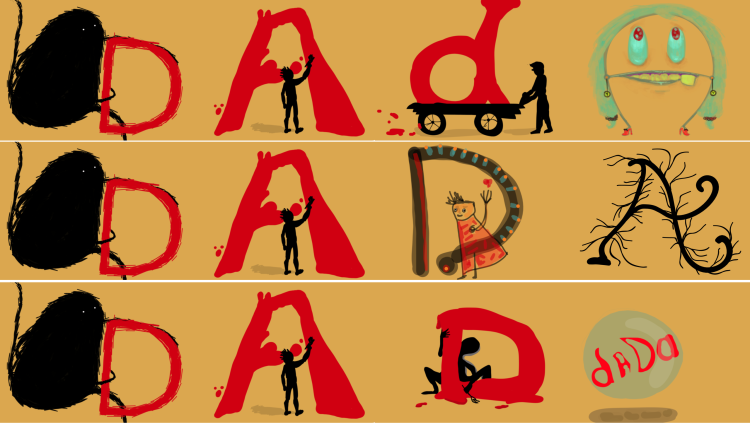 The fun of DADA is in collaborative and spontaneous creation so you cannot upload your existing art, but you can create as many new drawings as you like. We believe that the art you create spontaneously and in collaboration with others best represents who you really are. Can I use a nickname or artistic name? Sure you can, just think that your art will always be attributed to whatever name you choose, and it may be seen by a whole bunch of people inside and outside of DADA, so choose wisely. We encourage you to use your real name. Click on the orange icon with a pencil. This will get you a virtual canvas and simple drawing tools. You can choose background color, pencil colors, widths of the pencils, and transparency. You can go back, erase, and also save your drawing for later. When you are ready, you can add tags, choose to automatically share on Facebook, click on the “POST” button, and show your art to the world. 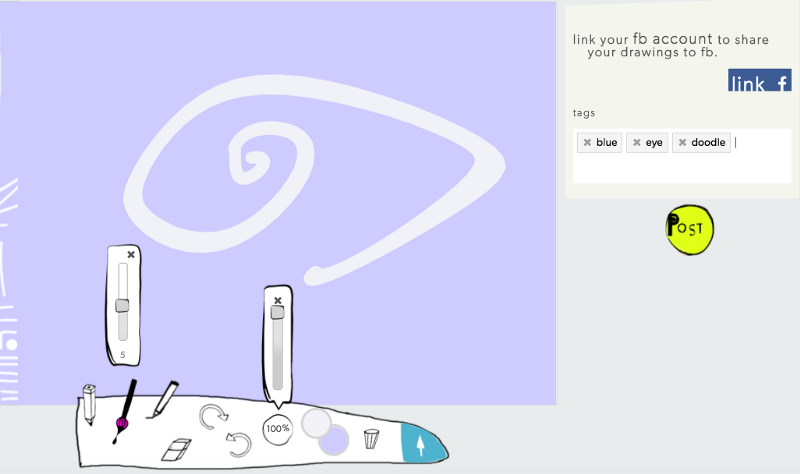 You will also see a brush icon at the end of a visual conversation, and if you have enough points to participate in that conversation (at least 200) you can draw from there as well. How can I draw with others? In order to participate in our visual conversations, you need to get your feet wet in the community first. So start by making drawings, following artists, appreciating them by giving them likes, and once you reach 200 points you can start participating in conversations of your level or lower. However, anyone with more points can draw with you. We do this so that people get the hang of it and they bring their best game to the conversations. How do I reach 200 points? By drawing, following artists (click on the star below the artist’s name), and giving likes (click on the heart icons above the drawings). What are the colored dots below my name? Those are the points you have accrued by participating in the community, mainly by drawing. Can I invite people to draw with me? Of course! The more the merrier. Before you post, you can fill in their name (if they are already on DADA), or scroll down from a list of DADA artists when you type in a name or type in email addresses of those you want to invite. You can also invite people who have not joined in yet by clicking on the share icon on the upper right corner of the page and invite people via email. Why can’t I find my drawing? Sometimes, when two or more people draw at the same time, a branch is created. Your drawing may have moved to that branch. You can look for branches on the thumbnails below the main conversation. To open a branch for your drawings or to draw on an open branch, you have to click on the conversation and get the large view. Then you’ll find the branch icons on top of the drawings. How can people find my drawings? 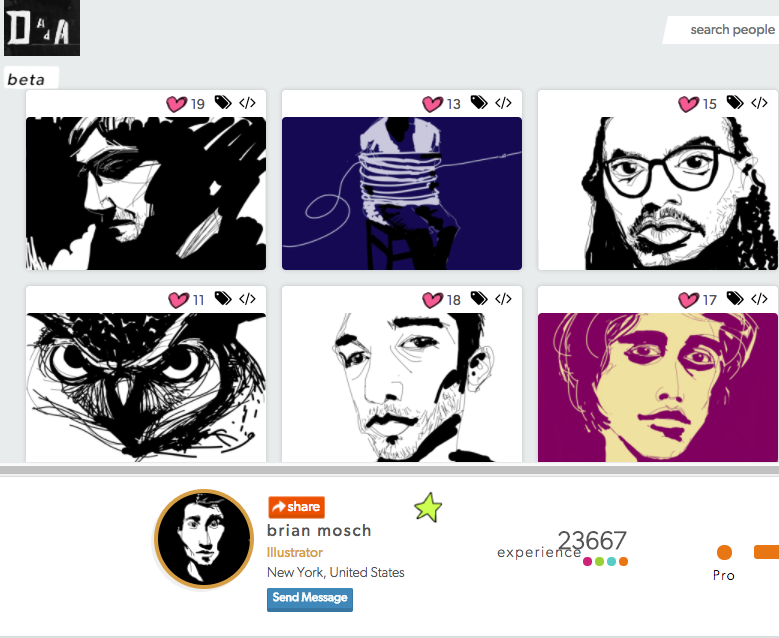 They can click on your name and go to your artist profile, where they can see all the drawings you have made on DADA. You can also tag your drawings by clicking on the black label icon. We recommend you tag with single words that literally describe the content and or style of your drawing (woman, tree, sun, night, portrait, cute, funny, horror, etc). Can I save a drawing for later? Yes, you can. Just click on the blue arrow at the bottom of your toolkit in the canvas. When you come back, you will get a prompt asking you if you want to continue using that drawing and which of the autosaved versions you’d like to use. Can I delete a drawing? To delete before posting, just click on the garbage can icon in your toolkit. How can I sell my art on DADA? For the moment, you can’t directly sell your art on DADA. You can start drawing and become part of the community. Anyone can sign up to DADA.nyc and it is free to use. 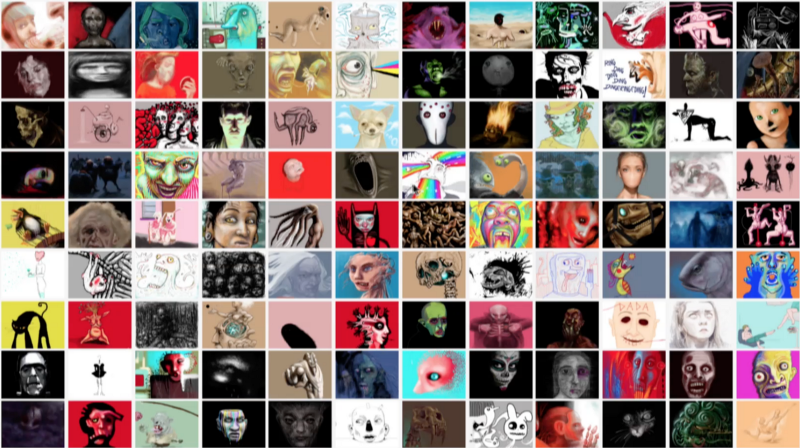 All the art is created by users on our platform. Nothing is uploaded. We keep the art gallery separate from the drawing platform, which is a space to freely enjoy drawing and create collaborative art with other artists. We started out our art gallery with a pilot art collection “Creeps & Weirdos”, and we will be issuing more collections from the about 100,000 drawings/conversations that we currently have on DADA, and from the ones that are created now and in the future. How can I get a wallet? Artists whose work is featured in our art gallery or anybody who wishes to purchase art can download a Metamask wallet. More instructions here. How can I buy art? To buy DADA art you need to have Ethereum cryptocurrency, which you can buy at an exchange like Coinbase. Once you change your fiat money into Ether you can send it to your Metamask wallet, which you will need in order to access the art gallery and purchase art for your collection. See question above for instructions on how to install Metamask. How can I add my art to my MetaMask? MetaMask is just a wallet that you need in order to buy art on DADA or, if your art is for sale, to receive money. You cannot add art to it. DADA has just issued one collection and we will be issuing more collections soon. We are working on how to put more art up for sale but, for the time being, it is not possible for individual artists to put up their art for sale directly in our marketplace because smart contracts need to be coded into all the artworks that we sell. Can I print out the digital drawing I bought? You can, but it will be a small print. Our drawings do not have the resolution to be blown up. This is rare digital art, and it is meant to be displayed and enjoyed on a screen. I purchased a drawing but it is not appearing in my collection. Ah, welcome to crypto transactions. They can be sluggish. Usually, you should be able to see your drawing in a few seconds. More than 5 requests per second might get backlogged on Etherscan, which is where all transactions are recorded. So please be patient.